Tag line: "The Jungle is JUMPIN'!" The Jungle Book is one of my favorite Disney films, partly due to its rich characterizations (something the studio was known for in its earlier days), but mostly because of the music; just about every tune in The Jungle Book is a toe-tapper. 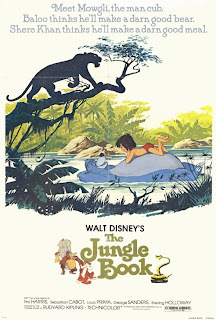 Based on Rudyard Kipling’s classic tale, The Jungle Book opens with the panther Bagheera (Sebastian Cabot) finding a human baby in the middle of the jungle. To ensure the “man-cub” is well cared for, he takes it to live with a wolf pack, where the child stays until he’s grown into a young boy. Once he’s too old to remain with the pack, the man-cub, whose name is Mowgli (Bruce Reitherman), is reunited with Bagheera, who intends to take the boy to the man-village so he can be with others of his kind. 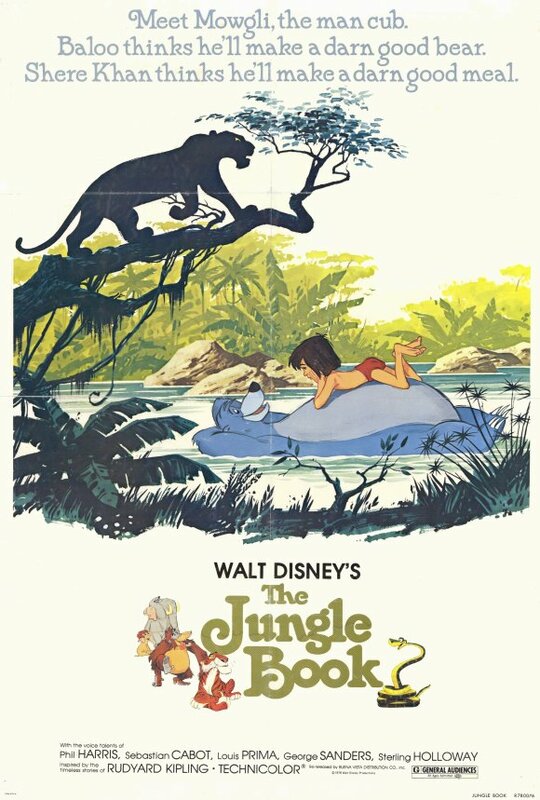 Along the way, they encounter some of the jungle’s more interesting creatures, like the deadly python Kaa (Sterling Holloway), King Louis (Louis Prima) of the apes, and Baloo (Phil Harris), a carefree bear who takes an immediate liking to Mowgli, promising to teach the boy (who doesn't want to leave the jungle) how to survive in the great outdoors. But with the evil tiger Shere Khan (George Sanders) on the prowl, the jungle is far from safe, and even with Baloo and Bagheera watching over him, Mowgli remains in terrible danger. An impressive list of actors lend their voices to The Jungle Book, including Sebastian Cabot and Phil Harris, who, as Bagheera and Baloo, form the perfect parental unit for young Mowgli, with Bagheera’s level-headedness balancing Baloo’s fun-loving ways. Disney regular Sterling Holloway (who, for years, was the voice of Winnie the Pooh) is good as the treacherous Kaa, and the wonderful George Sanders mixes sophistication with treachery as Shere Khan. Even Bruce Reitherman (the son of the film’s director) does a fine job as Mowgli, bringing a sense of wonder to the part. The film’s musical numbers, most of which were the work of longtime Disney composers the Sherman Brothers, are equally as strong. “The Bare Necessities” (written by Terry Gilkyson and expertly performed by Phil Harris) is the movie’s most recognizable tune, and it’s definitely a good one, but my favorite is “I Wanna Be Like You”, sung by renowned musician / bandleader Louis Prima, who portrays King Louis of the Apes. An upbeat, jazzy number with a New Orleans vibe (something Prima specialized in throughout his 40+ year career), I guarantee you'll be humming this song for days. In the end, I couldn’t blame Mowgli for wanting to stay in the jungle. Sure, growing up with other humans was the best thing for him, but I’m betting that, after his experiences with Baloo, Bagheera, King Louis and the others, the man-village would’ve seemed like a pretty dull place.